Topper Industrial is at the cutting edge of a trend in the manual materials handling (MMH) industry to utilize towable industrial carts rather than fork trucks as a solution for moving materials within a facility. Tugger AGVs (Automated Guided Vehicles) pull towable carts for moving materials in some industrial environments, from cellular manufacturing to large distribution centers. MHI Solutions shared that when a forklift operator moves a load of materials, they are seated behind that load, at times making it harder to see where they are going. Operators of the tugger or AGV systems move trains of multiple towable carts and can see the route around the facility more clearly. Topper Industrial carts have pioneered and patented this train of tugger pulled industrial carts by designing and manufacturing a specialized cart system that promotes single-piece flow in a value stream and minimize fork truck mileage. 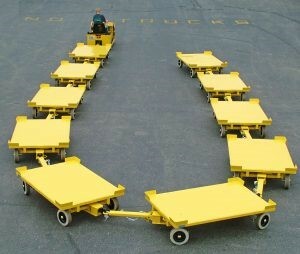 Before any other firm, Topper Industrial produced the first Mother/Daughter Cart system. It entailed different daughter carts that fit inside two different mother carts. A tugger pulled a train of these carts and stopped at an assembly station, where workers would remove the daughter carts, perform the operation, and then return the daughter carts to the mother carts. All pieces needed for an assembly moved as a “single piece” in a value stream. Once the carts arrived at final assembly, all pieces would arrive together, and assemblers would have everything they needed, spending no time searching, a frequent source of lean waste, for a few missing pieces required to complete assembly. The more carts that can be safely tugged with top grade casters, ergonomic safety considerations, translates directly to fewer trips back and forth. Every trip avoided is a calculated cost-savings. 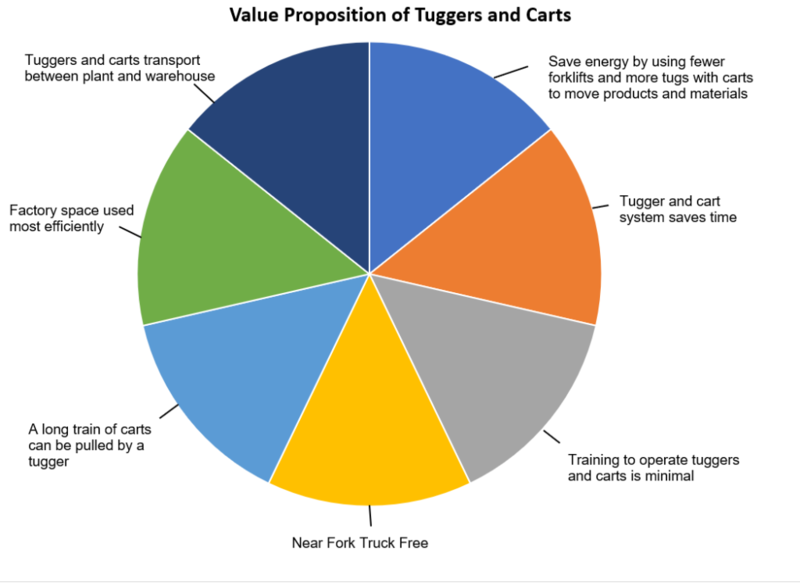 It is an exponential metric by which the value proposition of tugger pulled industrial carts can be demonstrably better than multiple, unnecessary back and forth transporting of goods to the line. Next post Topper Industrial to exhibit at Modex 2018 in Atlanta, BOOTH B4475. Get to know Topper Containers!